I’ve been dreaming of this trip for a decade or more. And planning it for two or three years. It was as good as I hoped it’d be. We spent six days in the backcountry, walked 42 miles, did 10,000 feet of gain and generally slept above 11,000 feet. 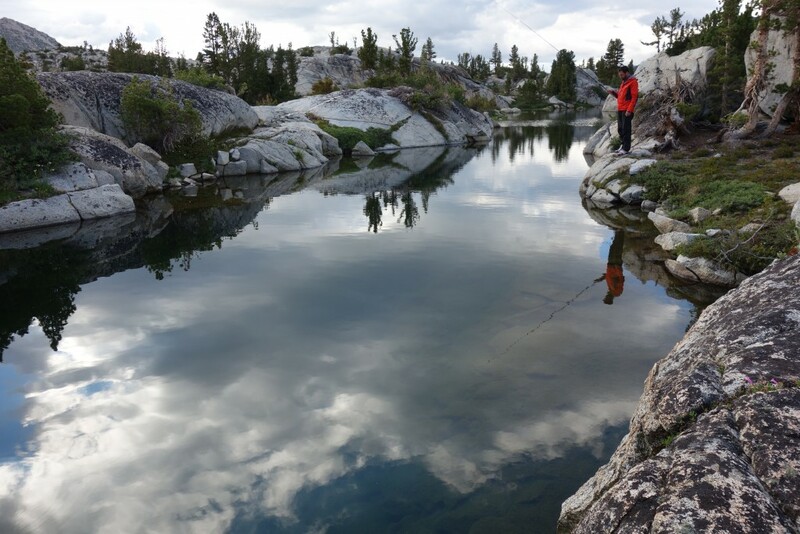 We saw forty lakes, few people (except on the PCT), walked cross country and scarcely-there trails, swam, took photos and fished. The forecast when we were heading out was bad – 60% chance of thunderstorms. We lucked out for the first four days, then got slammed as we were exiting back over Italy Pass. Around 2pm, I paused the group for a snack and to assess the dark slate clouds. My vote was to wait and see what developed. After a while, we walked on. We ended up sheltering amongst boulders, in lightning position, three times as the sky flashed and hail rained down. The weather had turned and mostly stayed wet all the way to the car the next day. For the last hour, I took my rain jacket off and walked in the storm like I was in the tropics. What a way to feel connected. Charlie looking down at Bear Lake and Ursa Lake. Seven Gables and Gemini are in the background. The other weather worth mentioning was that I saw the start of a tornado. Directly above our heads at Seven Gables Lakes a thunderhead had a spot that started swirling. It was a tight little whirl. Beautiful and stunning. But oh, thank goodness that it dissipated and never dropped a twister. Don’t know what I would have done if it had. It was darn nice to have plenty of time in the high alpine basins. Without mileage goals, we explored the area more fully than I otherwise would have. Depending on how I count it, we walked in nine distinct areas. Dani caught a fish at one of our favorite lakes with tenkara gear. We camped at lakes most nights, but there was one on our route that was truly special and on the list to return to. It’s swimming heaven and I want to carry in floaty toys next trip. My food was good because I used my dehydrator a lot. Most meals had 10+ ingredients. 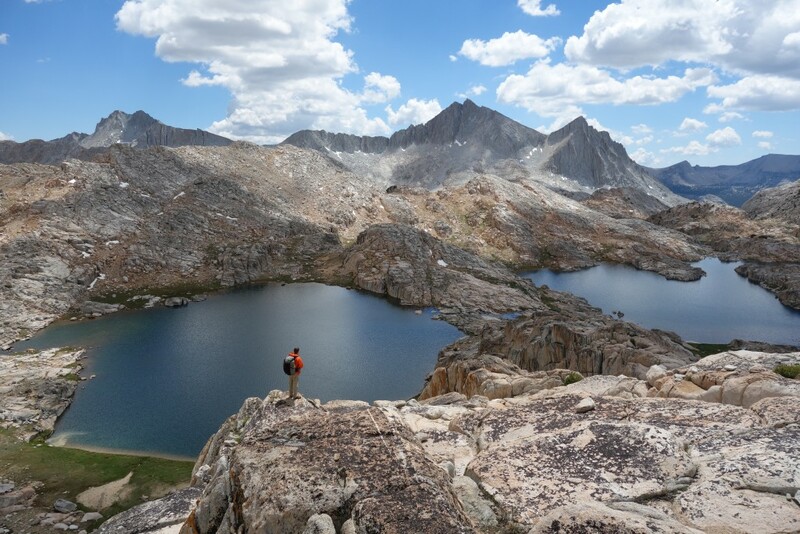 The Sierra High Route passes through the area we played in. I haven’t hiked that section of the SHR yet (I’ve been most places on it and completed ~60% of the route) but again, I’ve confirmed for myself that it’s a path that is ridiculously hard work. I don’t think most people realize how much effort the SHR is. All three buddies take really fantastic photos. I bought a new point-and-shoot camera before this trip and my pictures are pretty nice too. I tend to take more people and documentation pictures and fewer landscapes. 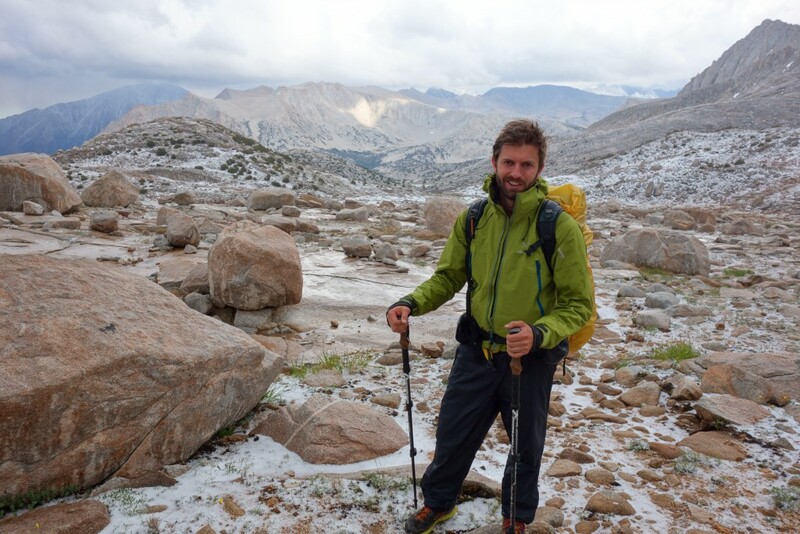 My previous trip in the area (to upper French canyon and Royce Lakes in 2009) was done solo, with a broken shoulder and only a fanny pack to carry overnight gear. That was wacky. Tenkara fishing was fun, but only moderately successful. I caught one small fish and hooked a few others. The July storm dropped a surprising amount of hail and snow. It even closed Tioga Pass for a bit. Charlie hiked in Vibram Five Finger shoes again. Like last trip. He’s crazy. Snapping a photo with fresh hail on the ground. I was in lightning position again about ten minutes after this picture was taken. have been in the same area , Italy Pass to Feather Pass ,down to Meriam Lake…Hutchinson Meadow up to East and West Pinnacles….taking wife this summer to Three Island Lake via PCT from Thomas Edison (the cross-country from Hutchinson Meadow up to Moccasin then over the ridge to West Pinnacles might be too tough for her)…..can you tell me the best way to Tether Lake from Three Island Lake, have never been on that side ,thanks. I envy you! This area has been on my list for the past few years but timing has never been right when I’m out in CA. Gorgeous photos, just makes me want to go more!